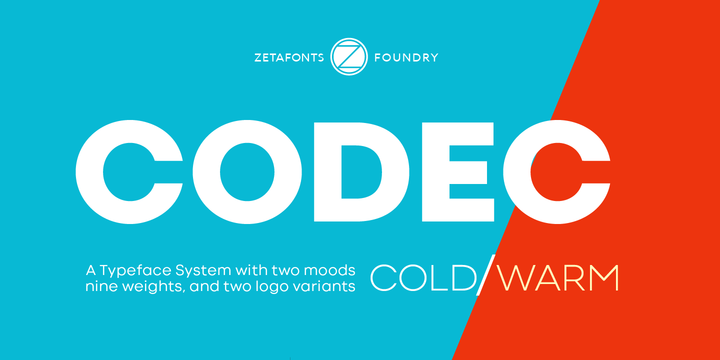 Codec is a contemporary typeface created by Cosimo Lorenzo Pancini together with Francesco Canovaro & Andrea Tartarelli and published by Zetafonts which is available in 44 styles, two moods (Cold & Warm) each with 9 weights (from Thin to Heavy) and italics. Also is has two logo variants. This versatile, geomatric sans serif font, comes in a wide range of OpenType features and over 70 languages with greek and cyrillic support. It is ideal for display use, logo, headline, poster, packaging, magazine, print, advertising etc. Have fun and design beautiful work with Code font! Price: starting from $29 for one font to $222 for all 44 fonts. A font description published on Tuesday, May 22nd, 2018 in Andrea Tartarelli, Cosimo Lorenzo Pancini, Fonts, Francesco Canovaro, Zetafonts by Alexandra that has 1,680 views.